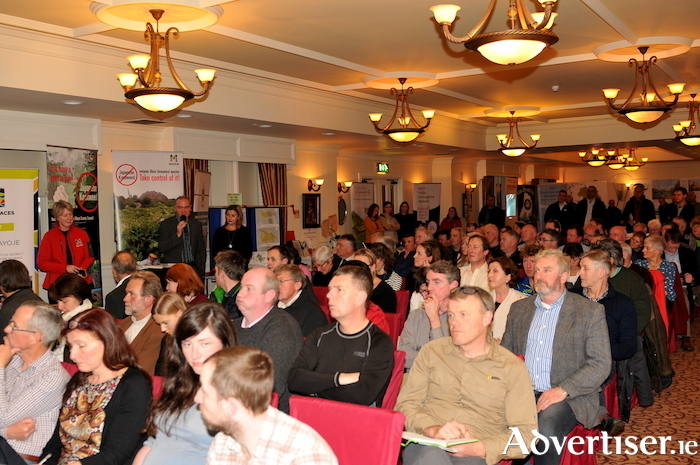 A large crowd in attendance at the recent Moy Trust information night at Mount Falcon Hotel. Photo: John O'Connor. Mount Falcon Estate in Ballina played host to an historic event organised by the Moy Catchment Association at the end of November. The event, billed as the Moy Trust Expo, brought both public and community agencies together to listen to presentations on the process involved in a trust formation, the benefits to both community and government agencies, and finally the steps ahead required to ensure it is inclusive and involves the entire community. The compere for the evening was Mid West radio’s Angelina Nugent, who carried out her role to perfection. More than 20 stallholders attended, and as well as introducing speakers Nugent took time to interview different community and government agencies about the potential benefits gained from developing a trust. This awareness event was opened by Fianna Fail councillor in the Ballina Municipal District, Michael Smyth, who spoke positively about the council’s role so far and the commitment it was willing to give in support of it. He was followed by Ray Spain, regional director for the waters and communities’ office, who outlined their role in facilitating communities to take a greater role in water quality resulting in healthy waters and vibrant communities. Hugh Bonner from Mara media, publisher of Ireland West Airport magazine as well as various fishing publications, spoke about the potential that exists to develop the Moy valley as a tourist destination that caters for all outdoor enthusiasts. He praised the foresight Mayo County Council had in promoting and developing resources for visitors to the area, and spoke of the need for all of us to put a greater value on our natural resources, work together, and get a greater return from our tourism industry. Jim Wilson rounded off the presentations by asking people to mingle and discuss with those in attendance, bringing forward suitable projects as well as nominating their willingness to join the future board being set up in 2018. If you would like to get involved, find out more, or know of someone you may think might have an interest in becoming involved, contact Ciaran Boland on 086 3800034 or Gary Smyth on 086 8384684. You can also contact both via e-mail, [email protected] and [email protected].